The Managing Director, Nigerian Ports Authority (NPA) Hadiza Bala Usman has charged members of the newly inaugurated pilotage boards to see their appointments as a “call to serve the nation in the national interest”. The Honourable Minister of Transportation, Rt. Hon. 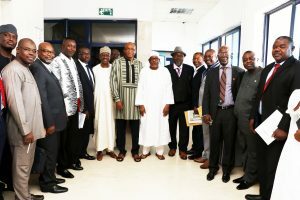 Rotimi Amaechi (standing 5th from left) with the members of the pilotage boards after their inauguration in Abuja today. She therefore implored the appointees to use their high professional skills and knowledge to improve pilotage services in the nation’s seaports within the areas of their jurisdictions. The Pilotage Boards inaugurated were those of Lagos, Warri, Bonny / Port Harcourt and Calabar Port pilotage districts, as provided for by the Port Act, with a life span of three years. While appreciating the appointees for accepting to serve on the boards, the Managing Director reiterated that their functions and responsibilities, as provided for in the Port Act, are crucial to the overall operation of the nation’s seaports in ensuring navigational safety and protection of the marine environment. The Director, Maritime Services of Federal Ministry of Transportation, Alhaji Sani Galadanchi (standing 7th from left), NPA Executive Director, Marine and Operations, Dr. Sokonte Davies (standing 6th from left) with the members of the pilotage boards after their inauguration in Abuja today. Speaking through the Executive Director, Marine and Operations of the Authority, Dr. Sokonte Davies, after the inauguration of the board by the Honourable Minister of Transportation, Rt. Hon. Rotimi Amaechi, Hadiza asserted that the Authority would provide all the necessary support and enabling environment members of the boards will require to succeed in their assignments. She assured members of the boards that their recommendations and submissions shall always guide the Management in ensuring navigational safety of the nations water channels in accordance with international best practice. Earlier while inaugurating the board, the Minister of Transportation, represented by the Director of Maritime Services, Alhaji Sani Galadanchi had said the members of the boards were carefully selected on the basis of their professional qualifications and requisite experience in the nation’s maritime industry, adding that much was expected from them. The Minister who admitted that the task before the members of the board is not an easy one, expressed optimism. “But we trust that you will bring to bare your wealth of experience and expertise to discharge your duties as provided under the Port Act”, he added. Recalling that the tenure of the last Pilotage Board elapsed in 2016, the Minister reasoned that it could be imagined that some of its responsibilities may have suffered lack of attention, expressing the hope that with their inauguration, quick steps will be taken to address all such matters. The Minister reminded the Board members of their functions to include the establishment of entry requirement for obtaining certificate or license in order to perform pilotage services, enforcement of the maintenance of developed standards and specification. Responding on behalf of other members of the pilotage boards, Capt. Adewale Ishola pledged the determination of Boards to live up to the expectations of the Authority in the discharge of their functions in accordance with the provisions of the Port Act.